Socialize with the elite. 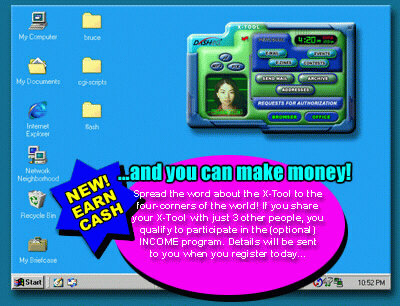 Become a part of a thriving digital world where others of like mind meet and share ideas around the X-TOOL! The X-TOOL gives you the option of deciding WHO you communicate with. Before any other TOOL users can contact you, you can "screen" your visitors -- including advertisers! Using proprietary filtering technology that virtually eliminates "SPAM" -- you'll never be bothered by unwanted individuals or companies ever again.